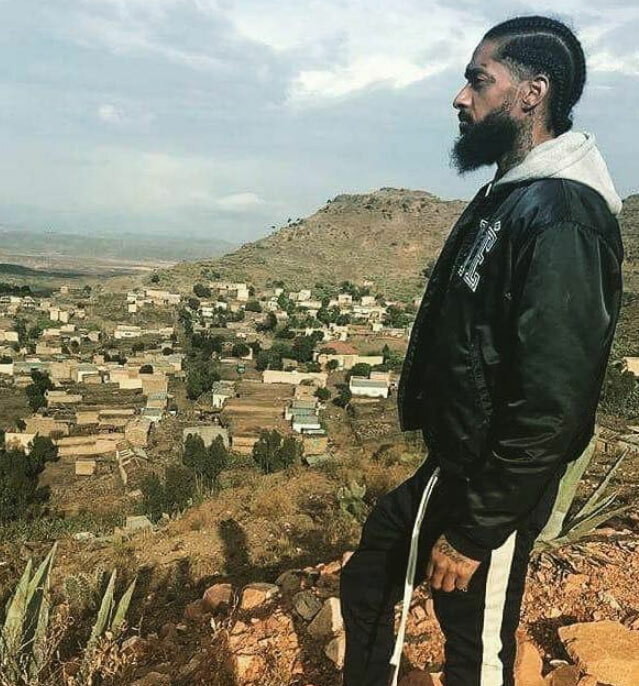 Eritrean American recording artist and entrepreneur Ermias Asghedom, better known by his stage name, Nipsey Hussle, is one of the few success stories of rappers turned into inspiring entrepreneurs. His life experience of transition from a teenage street rapper to a successful recording artist, emerging business power, and a father is surely reflected in his discography. His latest album “Victory Lap” is an album of mindfulness definitely worth a listen for spur. Ermias Asghedom has always had the support of his young Eritrean compatriots who’ve perceived his glory as their own. Q&A’s guest, today, is the legendary Nipsey Hussle. Q : Welcome back home Ermias. How does it feel to be back? It feels good. It has been fourteen years since I was here last. Seeing the way the city and everything else has changed is gratifying. I spent three months last time I was here. This time I’ll be around only for a couple of weeks. I am here to visit my family and reconnect with my grandmother, my cousins and everybody else. I love to be here. The people, the food, the culture and the lifestyle are extremely good. Q : Take me back to the beginning of your journey as a recording artist. What are your memories from then? I grew up in Los Angeles where Hip Hop was a big sensation in the 90s. Death Row Recordings was big and was located just down the street where we grew up. Tupac, Snoop, Ice Cube and a lot more artists were at their pick in the 90s. I grew up surrounded by art. What we saw on TV as children were filmed and recorded in LA. At that time for us to be like those artists, it seemed very tangible. I started writing and rapping when I was nine or ten years old. Back then music equipment was not as easily accessible as it is now. But as we grew older the equipment was more and more affordable and when I turned fourteen or fifteen we got our equipment and started recording our own music. Q : Who is this ‘we’ that you keep referring to? Q : You always write your own songs. What inspires you? Life. Growing up in Los Angeles is a unique culture in the streets. Hip Hop reflects what goes on in the streets, the neighborhood, the people, lifestyle and many others. I want to reflect those realities. Q : You are now an established recording artist of constant professionalism. What would Hip Hop be in your own words? A form of expression for young people who have so much to be told. It is a vocabulary, it is an art and it is a culture that originally was only of young people in America but now has gone global. The neighborhoods from where Hip Hop came out had unique environments and situations that made people search for a real and efficient form of expression. From police brutality to gang cultures, the riots, racial discrimination and more unique events that urged the growth of Hip-Hop in terms of music and Hip Hop in terms of culture and identity. The Hip Hop community in every part of America spoke about events that took place all over the country. In New York, for example, there was a graffiti movement and break dance movement. So, Hip Hop was like CNN for what was going on in the streets. Each region had a specific approach but deep down it was all about the struggle for equality and respect for African Americans. The story of Hip Hop is similar to that of Jazz. Music in America was an expression of our struggles; being black in America. And I, as an Eritrean-American, I feel connected to this aspect of the African American history. My father is from Eritrea and we have always been in touch with our Eritrean ancestry and culture thanks to him. However, we still grew up in South Central LA all of our lives. So our exposure was to the culture of Los Angeles, which was gang culture. I was born in 1985 and grew up in the 90s. The LA rise took place in 1992. Rooney King, the brutality of LAPD and all of the social issues that took place back then happened in our backyard. Q : No doubt that music, Hip Hop or Jazz, echoed the desire for freedom and equality for the African American population. However, with Hip Hop, the gang culture also became part of the artists’ lives. Hip Hop was a powerful and peaceful tool but at some moments was also linked to violence. I’d say you would know better as you are rooted in places like you correctly refer to as ‘the backyard’. Could you please elaborate on the bigger population of the international community which is not familiar with gang culture and its link to Hip Hop? Also, are gangs scary? Terrorizing? If you come from areas in which gang activities are common then that becomes part of who you are. You encounter it as a natural part of life. I guess the equivalent metaphor would be coming from a place of war. If you do you are conscious about war even as a child and later without even realizing it you become part of it. Afterward, these people of war areas become involved in different ways. Some of them become fighters, some become writers, some sing about it and some become politicians. Everyone, one way or another, creates a subliminal link to what he or she was growing up. And the gang culture is similar. It might have all started as self-defense but then everyone became part of it as it was the dominant culture of South Central LA. Young people, children, mothers, fathers, shop owners, entrepreneurs and just everyone takes part in it. However, everyone’s reaction and connection with it differs from one person to another. The word ‘scary’ or ‘terrorizing’ is for people who are not familiar with it. But for those who grow in it, it is just a serious matter. It has been there for generations. It is dangerous. People die. And if you trace it back, it originated from racial discrimination. Black people were being targeted by white gangs. It formed as a form of protection for your own black people. Q : Your ability to connect with your listeners by unlocking some sort of understanding is notable. Now, in your recent works, you are putting out conscious notes for your listeners to grasp through your music and see in your actual life as a self-reliant entrepreneur. Are we nearsighted to an avant-garde attitude to Hip Hop leaving behind the common themes revolving around lavish rides and models? You could say so. My recent music is about the reality of the business; the challenges of working for your own business and how to be a black young successful entrepreneur. I want my music to be an inspiration for individual growth in the economic sector. That is the path I took as I grew up and I want to put it in music. My life is different from when I first came out as a teenager with expressions from the teenage perspective of young men in the streets. Now, as I grew older and became successful in music and business my perspective changed accordingly. And so my art evolved with it. Q: What does being Eritrean mean to you? More than anything I am proud of being Eritrean. The history of our country, our struggle and the underdog story, the resilience of the people and our integrity is something that I feel pride in being attached to. Most definitely I do remain closely in touch with our history and our people. I have had the pleasure of performing in festivals of Eritrean communities like that of San Diego. We also went to Europe and participated in similar events with the community. Q : How is it, growing in an Eritrean family? Q : You have many fans here that feel your glory, success, and fame as their own. 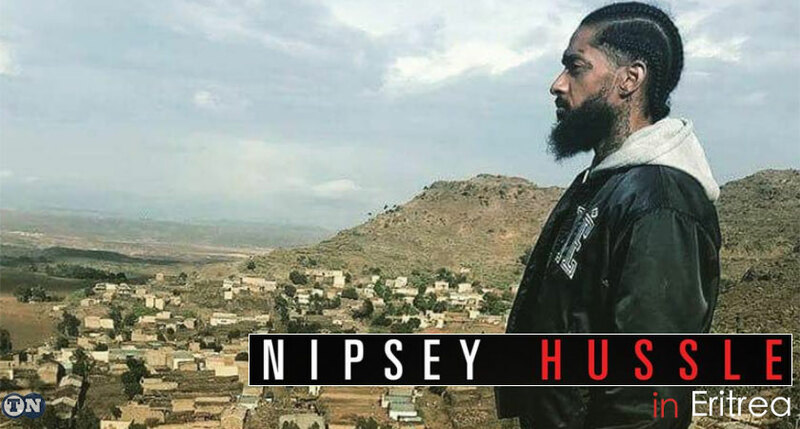 Q : Your stage name ‘Nipsey Hussle’ is a name that Eritreans here took the liberty of making their own as ‘Nebsi’, in Tigrigna literally translates to ‘self’ and as a slang refers to ‘homeboy’ or just ‘homie’. Therefore, the meaning that we have of your name is either ‘self-hustle’ or ‘the hustle of a homie’. Would you want to officially correct it in our national newspaper now? Absolutely not. Actually, the name was given to me by older friends who made a reference to a comedian called Nipsey Russell. I was educated about the Tigrigna link to my name recently and I am just so glad it makes sense in Tigrigna and there is no need at all to correct it. Let it be the way it is. That is how I want to keep it with my Eritrean friends and fans. Q : Ermias, is there anything you want to add before we finish our interview? Yes. Sadly that is the reality. But here in Eritrea, it is different. Had it been so in America, too, there would have been less violence, less insanity, and no violent families. You might have the material advantage in America but life is not all about that. 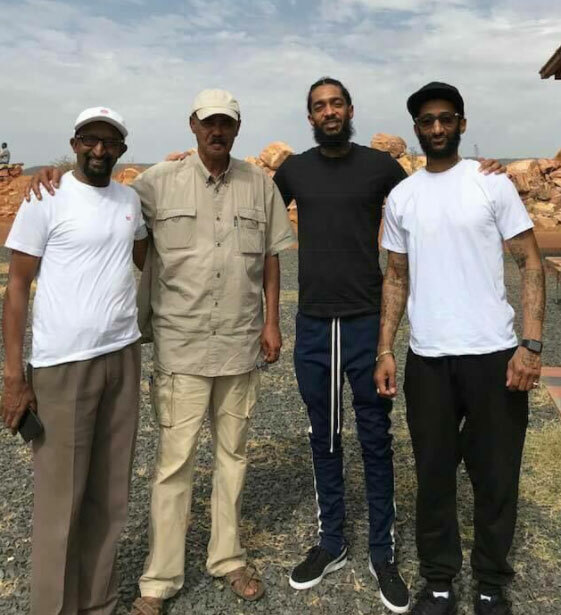 The sense of family, peace, and respect is alive out here in Eritrea. No drug addicts, no violent families. You might think money is important but it’s the togetherness and families being tight that make life better. All we think of in America is a concrete reality in Eritrea. As for me to be part of it is a pride I carry profoundly. Q : Thank you so much for your time. I wish you further success.